Subject: DANCE NEW AMSTERDAM: FOOFWA, CARTER, SONDHEIM PERFORMANCE!! Please come to this amazing event! the screening of videos by Foofwa d'Imobilite and Alan Sondheim. a succession of several "musings," separated by nothingness. body performance in real and virtual worlds. and sport, and Injuria (2004), on the precariousness of dancers. audience to construct the dance by voting in a public, democratic process. York-based Foundation for Contemporary Arts. 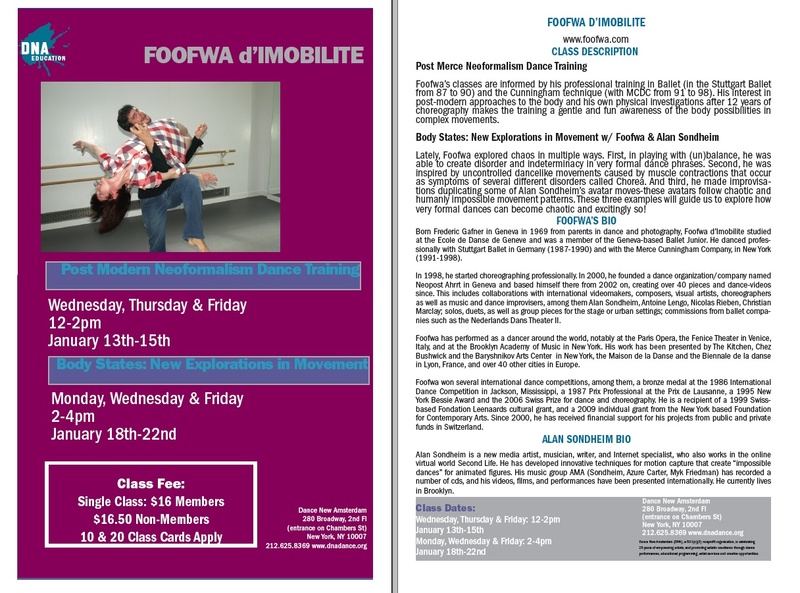 Subject: DANCE / MOVEMENT CLASSES AT DNA!